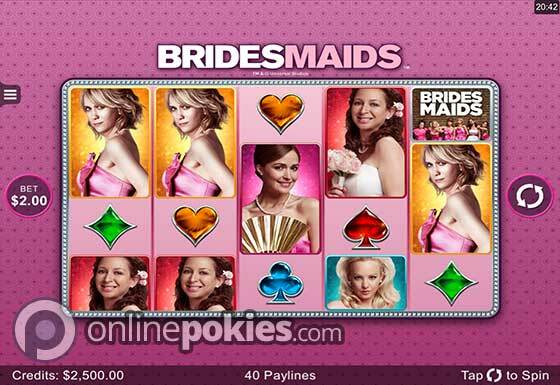 Bridesmaids is a 40 line online pokie from Microgaming that is officially licensed from Universal and based on the hit 2011 chick flick. The game offers a big 1,050,000 credit jackpot and a range of different bonuses. Join Annie, Lillian and friends on a wild ride down the road to matrimony with the Bridesmaids online poker machine from Microgaming. Based on the film the game features lots of bonuses (including two types of free spins), stacked wild symbols and uses a 4x5 reel layout. Minimum bet is 40 cents with max bet going right up to $300 per spin. You can select from credit sizes ranging from between 1 cent and 50 cents at most casinos that feature the game. The Bridesmaids logos are wild and appear stacked on all reels. Getting five of a kind pays 600 credits or 9000 if you're playing the max of 15 credits per line. You can get a whole screen of wilds which comes up diamonds and pays 360,000 credits. Three or more of the scattered Cake symbols triggers the Wheel Bonus where you can win a credit prize, a jackpot or any of the following bonus features. You can win up to three bonuses on one spin if you uncover the extra pointers before you spin. Select scenes from the film to win.. Finding the Carrot ends the bonus. We would have preferred if you got one of the bonuses every time you triggered the feature but this is not the case and it can be a bit of a let down if you get one of the lower multipliers and no other bonus.